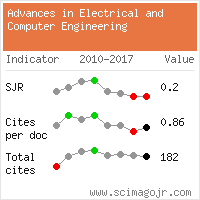 Methods of Simulated Annealing and Particle Swarm Applied to the Optimization of Reactive Power Flow in Electric Power Systems, PIJARSKI, P., KACEJKO, P.
Methods for Estimating One-Diode Model Parameters of Photovoltaic Panels and Adjusting to Non-Nominal Conditions, VIEIRA, F. H. T., CORREA, H. P.
Variation of Tower Footing Resistance on the Lightning Surge Propagation through Overhead Power Distribution Lines, MARIUT, E. L., HELEREA, E.
Broken Bar Fault Detection in IM Operating Under No-Load Condition, RELJIC, D., JERKAN, D., MARCETIC, D., OROS, D.
Semi-Supervised Multi-View Ensemble Learning Based On Extracting Cross-View Correlation, ZALL, R., KEYVANPOUR, M. R.
Particle Swarm Optimization with Power-Law Parameter Based on the Cross-Border Reset Mechanism, WANG, H., FEI, Y., LI, Y., REN, S., CHE, J., XU, H.
LEE, Y. , KIM, P. , PARK, Y. As the amount of data in the cloud grows, ranked search system, the similarity of a query to data is ranked, are of significant importance. on the other hand, to protect privacy, searchable encryption system are being actively studied. In this paper, we present a new similarity-based multi-keyword search scheme for encrypted data. 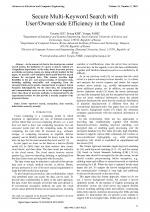 This scheme provides high flexibility in the pre- and post-processing of encrypted data, including splitting stem/suffix and computing from the encrypted index-term matrix, demonstrated to support Latent Semantic Indexing(LSI). On the client side, the computation and communication costs are one to two orders of magnitude lower than those of previous methods, as demonstrated in the experimental results. we also provide a security analysis of the proposed scheme. Hybrid Solution for Privacy-Preserving Access Control for Healthcare Data, SMITHAMOL, M. B., RAJESWARI, S., Advances in Electrical and Computer Engineering, ISSN 1582-7445, Issue 2, Volume 17, 2017. Disclaimer: All information displayed above was retrieved by using remote connections to respective databases. For the best user experience, we update all data by using background processes, and use caches in order to reduce the load on the servers we retrieve the information from. As we have no control on the availability of the database servers and sometimes the Internet connectivity may be affected, we do not guarantee the information is correct or complete. For the most accurate data, please always consult the database sites directly. Some external links require authentication or an institutional subscription. Web of Science® is a registered trademark of Clarivate Analytics, Scopus® is a registered trademark of Elsevier B.V., other product names, company names, brand names, trademarks and logos are the property of their respective owners. Website conception, design and maintenance by Eugen COCA. Content updated on 28 Feb 2019. Site engine updated on 28 Feb 2019. This page was generated on the server in 0.073 seconds and loaded in your browser in > seconds.